After skipping Class A, the Florida State League was expected to pose a challenge for Dillon Peters, but he continuously passed that test with flying colors. So the southpaw moved up to Double-A and proved successful right out of the gate. Miami's No. 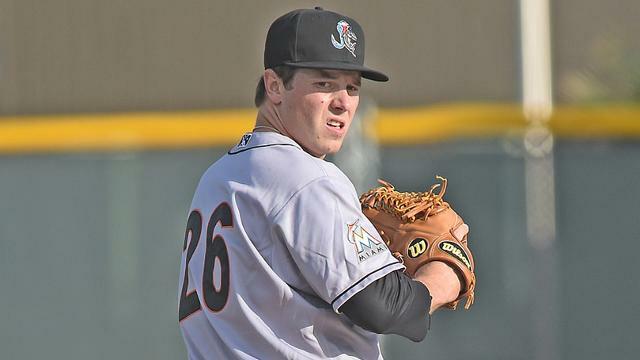 14 prospect pitched 6 2/3 scoreless innings in his Southern League debut for Jacksonville on Tuesday. He scattered five hits and three walks while striking out five in the Suns' 3-0 win over the Chattanooga Lookouts. "I don't think I was nervous," Peters said. "It's the same game, just keep the ball down and stay ahead of the hitter. I was on the same page as [catcher] Cam [Maron] all night, just like I was back in high-A, which I think is the most important thing." The 23-year-old induced eight groundouts -- including two double plays -- to extend his scoreless streak to 24 innings across Double-A and Class A Advanced. "Keeping the ball low and out of the air, that's kind of my game, and it worked out," Peters said "The defense was really good tonight and it was nice to get out of those innings with as few pitches as possible." The 2014 10th-rounder exited after issuing two walks in the seventh and throwing 59 of 82 pitches for strikes. "I actually had pretty good command," Peters said. "I think I was 20 for 24 on first-pitch strikes. The last inning, I just kind of fell off a little bit and crept up on the pitch count. But I was establishing my fastball early in the count and staying ahead of the hitters. I think that's why I went as deep in the game as I did." He was promoted from Jupiter after going 11-6 with a 2.46 ERA over 20 starts. He surrendered four earned runs over 28 1/3 innings in July and began this month with six three-hit innings against St. Lucie. "I found out [about the promotion] on Saturday while we were waiting during a rain delay," he said. "I threw a bullpen that day and I was just sitting there in the locker room when [Marlins vice president of pitching development Jim Benedict] called me in along with our coaching staff. They told me that I was going up to Jacksonville the next day. "I didn't think it was going to happen so soon. I was just going to keep my head down and just keep grinding and do whatever the organization asks me to do. If I was going to start in low-A, I'll start in low-A; if I was going to start in high-A, I'll start in high-A. I pitched my way out of the Florida State League and I'm just going to keep doing what they ask me to do. I can't complain about the situation I'm in right now. I'm very happy and very blessed." Tyler Higgins didn't allow a hit after relieving Peters in the seventh and Sean Donatello picked up his seventh save with a perfect ninth. Kenny Wilson delivered a two-run triple in the seventh for the Suns. Minnesota's No. 23 prospect Felix Jorge gave up three runs on seven hits and one walk while striking out two in 6 2/3 frames for Chattanooga. Michael Peng is a contributor to MiLB.com. Follow him on Twitter @MichaelXPeng This story was not subject to the approval of the National Association of Professional Baseball Leagues or its clubs.